HyperNEAT, which stands for Hypercube-based NeuroEvolution of Augmenting Topologies, is a method for evolving indirectly-encoded artificial neural networks (ANNs) that was first introduced in 2007. By exploiting a unique indirect encoding called Compositional Pattern Producing Networks (CPPNs) that does not require a typical developmental stage, HyperNEAT introduced several novel capabilities to the field of neuroevolution (i.e. 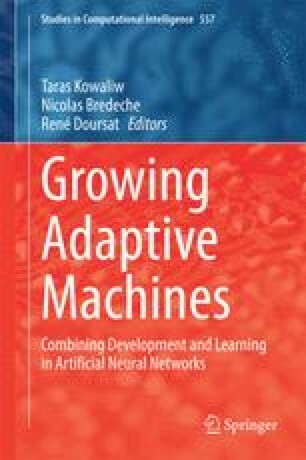 evolving artificial neural networks). Among these, (1) large ANNs can be compactly encoded by small genomes, (2) the size and resolution of evolved ANNs can scale up or down even after training is completed, and (3) neural structure can be evolved to exploit problem geometry. Five years after its introduction, researchers have leveraged these capabilities to produce a broad range of successful experiments and extensions that highlight the potential for future research to build further on the ideas introduced by HyperNEAT. This chapter reviews these first 5 years of research that builds upon this approach, and culminates with thoughts on promising future directions. Much of the work on HyperNEAT at the Evolutionary Complexity Research Group at the University of Central Florida was supported by DARPA through its Computer Science Study Group program, including Phases 1, 2, and 3 (grants HR0011- 08-1-0020, HR0011-09-1-0045 and N11AP20003). This chapter does not necessarily reflect the position or policy of the government, and no official endorsement should be inferred. HyperSharpNEAT by David D’Ambrosio is an extension of Colin Green’s SharpNEAT1, which is written in C#. HyperSharpNEAT contains an implementation of multiagent HyperNEAT and has been augmented by Joel Lehman and Sebastian Risi to contain the LEO, ES, and adaptive HyperNEAT extensions. SharpNEAT2 by Colin Green, which includes a different version of HyperNEAT, is also written in C# and contains several example experiments as well as tutorials on making new ones. Keepaway HyperNEAT C# by Philip Verbancsics is distributed with a C# implementation of the Robocup simulator. Another HyperNEAT Implementation (ANHI) by Oliver Coleman extends the Java-based ANJI implementation of NEAT (itself by Derek James and Philip Tucker). AHNI includes several visual processing experiments. HyperNEAT C++ by Jason Gauci comes with visual discrimination and checkers experiments. Links to all these software packages can be found at http://eplex.cs.ucf.edu/hyperNEATpage/.